24 is a cleverly crafted entertainer that is worth your time and money, feels S Saraswathi. Manam director Vikram Kumar’s latest offering 24 is a science fiction thriller that explores time travel. The film is produced by Suriya’s 2D Entertainment and has the versatile actor play a triple role. Music is composed by AR Rahman, while the credit for the stunning camerawork goes to popular cinematographer Tirru of Krrish 3 fame. Samantha Ruth Prabhu, Nithya Menen and Saranya Ponvannan essay significant roles. Director Vikram adds plenty of excitement to this fascinating concept, ending with the theory that any such discovery can only bring grief. 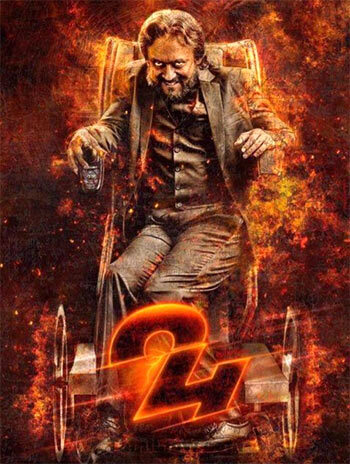 The story revolves around a power-hungry businessman Athreya (Suriya), who is on a mission to control time. His twin brother Sethuraman (also Suriya) is a reputed watchmaker and a scientist experimenting with the mechanism of watches as a source of time travel. The film opens with some high octane drama, as Athreya ruthlessly murders Sethu and his wife Priya (Nithya Menen). Sethu manages to save his young son and his precious watch before he is shot dead, while Athreya is badly injured and lands himself in a coma. The narrative moves 26 years ahead and we are introduced to Mani (Suriya again), Sethu’s son, who has also grown up to be an excellent watchmaker. Meanwhile, Athreya wakes up from his coma even more determined to possess the watch. The stakes are higher this time, as the wheel-chair bound Athreya wants his youth back. Will he be successful in going back in time to change the circumstances that has him crippled? The first half ends on a thrilling note with promises of an intriguing second half that the director delivers big time. The screenplay is loaded with unpredictable twists that will keep you on the edge of your seat. The pace never slackens except for the ridiculous romantic angle between Mani and Sathya (Samantha). The beautifully composed songs by Rahman are well picturised, but act as speed breakers to the narrative. There are also far too many coincidences and repeated dialogues that get tedious. Suriya, however, is undoubtedly the star of the show, especially as the cold-blooded Athreya, showing no mercy. It is not just his body language and dialogue delivery, but the aura of evil that he portrays effortlessly is brilliant. Saranya Ponvannan as Mani’s mother is admirable, but Samantha is mere eye candy and Nithya's appearance is so brief. The graphics are excellent, and equally stunning are the music and visuals. Director Vikram’s 24 is a cleverly crafted entertainer that is worth your time and money.